Upper left margin: And after that, the king’s son blessed his father for David’s release and said, "No evil has come from David and he has always been at [your] service; what has happened that you attempt to kill him?" Upper right margin: Afterwards David came to the battlefield and slew a group. Lower left margin: The king had a spear in hand and he threw it at David; David repelled his spear. Lower right margin: The king sent a company to David’s house to kill him. Upper left margin, corner: The king’s son supplicates his father for David’s deliverance. Upper right, below Latin: Afterwards David came to the king’s sleeping quarters and killed a group [of the enemy]. Lower left margin, corner: The king threw the spear at David but he repelled it. 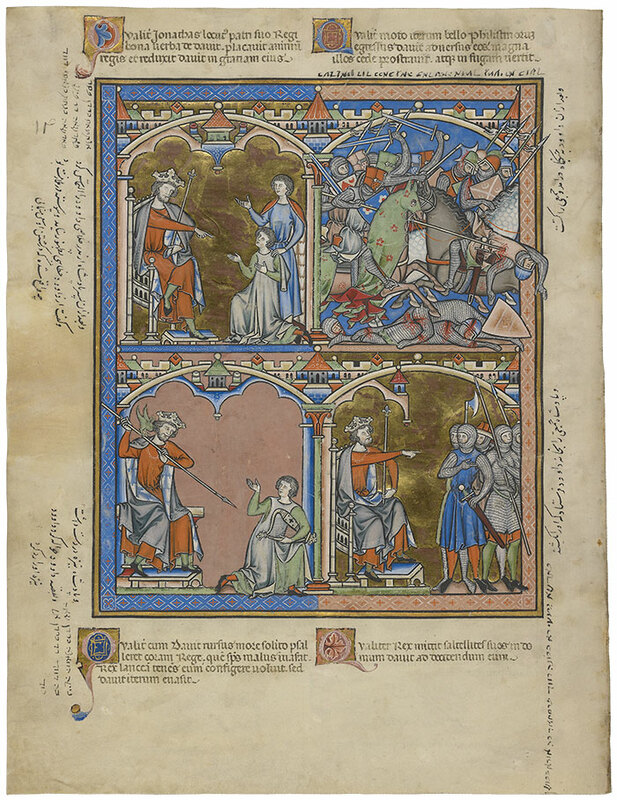 Lower right margin, corner: The king sends a group [of men] to David’s house in order to kill him.